Detective Inspector Pete Kennedy is still celebrating his latest successful case when he’s pulled out of the pub and back onto the toughest streets in London. A teenager has been shot dead and all the signs are it’s gang-related. Kennedy’s beat is the nightmare world of north London housing estates where boys kill and are killed for coming from the wrong postcode. Soon he has a prime suspect in his sights but the gang he is up against won’t give up without a fight – even if that means taking the battle to a police officer’s own family. As Kennedy tries to build a case in the face of a wall of silence, he encounters the next generation of street criminals – not yet in their teens, but already preparing to follow their older brothers on the road to riches, prison or death. And as the war between two gangs escalates, Kennedy is drawn into confrontations that take him way beyond the police rule book, and leave him confronting the toughest choices a policeman – or any man – can face. Following my resolution to read more ‘indie’ authors. 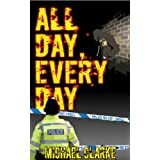 and currently only being available in ebook format, ‘All Day Every Day’, was definitely a smarter than average crime read that holds promise in reaching a wider readership. Drawing on his experiences as a seasoned crime reporter, Clarke has skilfully constructed a portrait of both modern London and the demands that the insidious rise of gang culture places on the Metropolitan police force. Charting the interactions between an investigating team and a group of black youths firmly esconsed in gang life, Clarke brings to life a world of threat and violence that despite the bounds of fiction, is a world we all know to be shockingly real. Opening with a lively and self-congratulory celebration of a successful court case, DI Kennedy and his team have little time to enjoy themselves, being drawn back onto the streets to investigate a gang-related shooting. What unfolds is a dual-layered storyline, which brings both the police and the gang members into sharp focus, as Clarke adroitly portrays the professional life of Kennedy, a determined police officer whose personal life is invaded by his involvement in the case, causing him to flout the rules of his profession, in counterbalance with the day-to-day lives of the gang members he pursues. In relation to the latter, Clarke offers an inherently sympathetic portrayal of young men and boys, having been sucked into a world of violence, hemmed in by their home environments and the pressure of their peers. Clarke balances the violence and immorality of their everyday existence with the underlying theme of lives wasted as some characters have the propensity for a life well lived, but unable or unwilling to fulfil their potential, having become trapped within the confines of their everyday existence. The characterisation depicting both sides of the fence therefore is extremely well-defined, and more importantly believable, adding a real strength to the narrative as a whole. The first third of the book in terms of pace and dialogue is extremely taut as the police embark on their pursuit of the murderers of a black youth, bringing them into the familial and social circles of those they pursue. I did feel that the book lost a little of its vitality in the middle section of the book as there was a little too much focus on the more mundane activities of the gang memebers, and that the intitial tautness was lost a little, but nothing that could not be remedied by some tighter editing, and a slightly reduced page count. This is in no way a criticism of the standard of writing in the book as a whole, as in terms of location, plot development and characterisation there is much to recommend it, and the tension of the central investigation is palpable and carried successfully throughout. Consequently, I was impressed with this debut novel, and would have no hesitation in recommending it to others. It does indeed sound like a good read. I always like novels that explore different parts of diverse cities like London. This may not be exactly the part of the city the tourists visit, but it’s nonetheless authentic. Thanks for the recommendation. Thanks Margot. All Day Every Day definitely transports the reader to a layer of society and deprived location that is outside of most people’s experience, but equally one that I feel passionately people should be more aware of.